In the course of researching patient cases and working on my next book, I read a lot of research studies. Sometimes, I come across information that wasn’t really what I was looking for, but is fascinating! I have several patients who have chronic Lyme disease (yes, there is such a thing, but that’s a different subject…) and neurologic problems from depression/anxiety to failing memory, movement disorders, and even seizures are often commonplace in this type of patient. I was looking up more information about how oxidative stress, one of the underlying processes that drives neurologic problem progression, affects the brain. Along the way, I came across this study about N-acetyl cysteine and Aspartame. N-acetyl cysteine, or NAC, is a precursor to glutathione (a powerful antioxidant) and as such it is a great tool to help reduce oxidative stress. Aspartame, more commonly known as NutraSweet, is a very common artificial sweetener. This research study (see link below) was published in the journal Neurochemical Research in 2014, looked at NAC being used to protect the brain from the effects of Aspartame. Now mind you, if you ask 50 random people if they think NutraSweet is safe, most will claim it is and offer you a tinfoil hat if you mention anything about Monsanto and conspiracy to push the product to market. However, that is actually now an accepted fact, as Monsanto purchased G.D. Searle in 1985-the very company that held the patent to aspartame. In 1980 the FDA had banned aspartame, because the Board of Inquiry found that it might cause brain tumors. The Searle chairman at the time vowed he would get it approved. The chairman would later become famous as the Secretary of Defense, Donald Rumsfeld. A new FDA commissioner was appointed, who added people to the FDA board, and personally voted to break a tie and make aspartame legal. He later became employed by a public relations firm contracted by Monsanto and GD Searle. This product is now used in over 6,000 products, including over 500 different drugs. The study in the Journal of Neurochemical Research matter-of-factly states that “Long-term intake of aspartame at the acceptable daily dose causes oxidative stress in rodent brain mainly due to the dysregulation of glutathione homeostasis”. It goes on to explain that aspartame reduced several antioxidant levels that are critical to brain health. They did find that NAC was able to exert a protective effect on the brain when it had been exposed to aspartame’s toxic effects. In case you were wondering, that isn’t the only study that shows toxic effects of NutraSweet. Others have shown elevated cytokine levels (inflammation), as well as harmful/imbalancing effects on the gut microbiome. Sometimes it is best to go back to what the body evolved and optimized to consume as food. The key word there is food, not chemistry! While many people are attempting to be on low-carb and Paleo diets to promote weight loss and health, the use of artificial sweeteners is definitely not a good addition to these diets. Some diets, such as South Beach, are actually recommending the full-fledged replacement of all simple carbs with artificial sweeteners. Many diabetics, the very people who need more insulin sensitivity and better glucose control, rely on very large doses of artificial sweeteners that are far above what is used in studies. For those pursuing a more traditional approach, the facts are even more clear. Consider that Paleo is supposed to mean Paleolithic; cave-dweller or hunter-gatherer. For 99+ percent of human existence, we’ve eaten meat, fish, vegetables, fruit, nuts-essentially whatever could be picked, dug up, gathered, or killed in the region and season being occupied. I’m pretty certain that didn’t include Monsanto’s chemical cocktails. Impact of aspartame and saccharin on the rat liver: Biochemical, molecular, and histological approach. Alkafafy Mel-S, Ibrahim ZS, Ahmed MM, El-Shazly SA. Int J Immunopathol Pharmacol. 2015 Jun;28(2):247-55. doi: 10.1177/0394632015586134. Epub 2015 May 26. Longer period of oral administration of aspartame on cytokine response in Wistar albino rats. Choudhary AK, Sheela Devi R.
Endocrinol Nutr. 2015 Mar;62(3):114-22. doi: 10.1016/j.endonu.2014.11.004. Epub 2015 Feb 11. Palmnäs MS, Cowan TE, Bomhof MR, Su J, Reimer RA, Vogel HJ, Hittel DS, Shearer J.
PLoS One. 2014 Oct 14;9(10):e109841. doi: 10.1371/journal.pone.0109841. eCollection 2014. Suez J, Korem T, Zeevi D, Zilberman-Schapira G, Thaiss CA, Maza O, Israeli D, Zmora N, Gilad S, Weinberger A, Kuperman Y, Harmelin A, Kolodkin-Gal I, Shapiro H, Halpern Z, Segal E, Elinav E.
Soffritti M, Padovani M, Tibaldi E, Falcioni L, Manservisi F, Belpoggi F.
Am J Ind Med. 2014 Apr;57(4):383-97. doi: 10.1002/ajim.22296. Epub 2014 Jan 16. Review. Effect of aspartame on oxidative stress and monoamine neurotransmitter levels in lipopolysaccharide-treated mice. Abdel-Salam OM, Salem NA, Hussein JS. Neurotox Res. 2012 Apr;21(3):245-55. doi: 10.1007/s12640-011-9264-9. Epub 2011 Aug 6. Aspartame administered in feed, beginning prenatally through life span, induces cancers of the liver and lung in male Swiss mice. Soffritti M, Belpoggi F, Manservigi M, Tibaldi E, Lauriola M, Falcioni L, Bua L.
Am J Ind Med. 2010 Dec;53(12):1197-206. doi: 10.1002/ajim.20896. Aspartame and incidence of brain malignancies. Davis DL, Ganter L, Weinkle J. Cancer Epidemiol Biomarkers Prev. 2008 May;17(5):1295-6. doi: 10.1158/1055-9965.EPI-07-2869. No abstract available. Life-span exposure to low doses of aspartame beginning during prenatal life increases cancer effects in rats. Soffritti M, Belpoggi F, Tibaldi E, Esposti DD, Lauriola M.
This entry was posted in Uncategorized and tagged artificial sweeteners, aspartame, brain, Lyme, microbiome, monsanto, n-acetylcysteine, NAC, nutrasweet, oxidative stress, paleo, searle on April 10, 2016 by Dr. Richard Matthews. Sometimes things happen that seem to come out of nowhere. It happens to all of us, usually when we least expect it because we are busy taking care of others or life in general. So here’s a scenario: Imagine that one day your blood sugar suddenly skyrockets and your Medical physician informs you that your liver and pancreas are not functioning properly. What could cause this? Well, many things could, but the one thing in common is inflammation. If the pancreas is inflamed, the Islets of Langerhans sometimes stop producing insulin and blood sugar doesn’t get stored, so it jumps up. If the inflammation is early in life, the immune system may go to the point of forming antibodies to the Islets, destroying them and causing Type 1 diabetes. If the body becomes inflamed later in life, cells may not respond to insulin anymore, causing Type 2 diabetes. But if the pancreas is inflamed, it doesn’t work properly. The liver can be implicated too, as it stores extra energy (glucose) reserves for when you need them. Liver inflammation can also cause diabetes. While these changes are all known to occur in people that are obese and have an unhealthy diet, how is it possible for it to happen this quickly, and in someone who isn’t obese? The answer lies in the fact that the immune system is mostly controlled by our gut bacteria and GALT, or gut-associated lymphoid tissue, dendritic nerve endings, and other points of information exchange between the microbiome and the host immune system. Research has shown that exposure to short-term social/emotional stress causes alteration of the gut microbiome. This altered microbiome in turn does not control the immune system approriately, resulting in increased systemic inflammation (which can make the social stress worse, as both the inflammation and the altered microbiome affect brain function and mood). 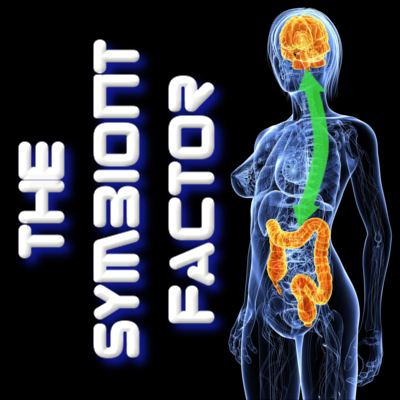 See the illustration above, which is from my book The Symbiont Factor. Another factor that can alter the microbiome and trigger widespread inflammation is short term dietary change, to a less beneficial diet. In research terminology, a diet that causes microbiome demise, inflammation and disease is called a Western Diet. It is used to produce a sick lab animal to study, and mimics what the average American consumer eats every day. Sleep is absolutely necessary for a healthy microbiome, and disruptions of our circadian rhythms and sleep cycles has been shown to disrupt our microbiome and cause inflammation. Exposure to air affects our microbiome too! Air is actually replete will huge numbers of human skin cells and bacteria from other people in the vicinity. The longer we are in a space with other people, the more we inhale parts of their microbiome combined with the microbiome of the space. These organisms then influence our own microbiome, so if the exposure was to unhealthy microbiomes, the result can be…inflammation once more. Sometimes the scenario can revive imbalances and infections we’ve had before, such as chronic viral infections (shingles, for example, or herpes) or chronic bacterial infections such as Lyme disease-where the organism was in a dormant state due to good immune function-waiting for an opportunity. Ok, so…can we picture a scenario where all of the above are combined? Stress, bad food, interrupted sleep with no real dark/light cycles, and lots of sick people/bad bacteria? Bingo-it’s the place where we send people to get well: a hospital. What should we do to recover from this systemic inflammation? Regular sleep, hitting the bed and waking same time every day, preferably in a multiple of 90 minutes. So, 6 hours, 7.5 hours, 9 hours so that we don’t interrupt a sleep cycle. No lights, no devices at night. No bright little blue “charging” LEDs. Healthy food, and preferably some of it fermented. There is a great fermented oatmeal recipe earlier on this blog, and many areas have private individuals making fantastic fermented vegetables. Here in coastal Maine, “A Stone’s Throw to Health” is one such business, with handcrafted ferments by Sheila Perloff-Eddison. Avoid deep fried food, hydrogenated fats, sweets, gluten. Even if you’re not gluten sensitive, eating it when you’re inflamed raises the odds of you becoming gluten sensitive. No fast food. Real meat, vegetable, greens, fruit. Probiotic Bifidobacteria, in double the normal doses. Add prebiotic inulin, pectin, FOS, GOS supplements to help feed the newly introduced organisms. Curcumin is hugely effective for reducing inflammation, improving insulin sensitivity, healing liver and pancreas. Not turmeric, which is 5% curcumin, but 95% curcumin-the real stuff. I take 6-8 capsules a day, minimum, if I’m injured or inflamed. It works better than drugs-check out the Ghosh study in the bibliography below. Some other products, such as jerusalem artichokes/sunchokes, jicama, artichokes, asparagus, pomegranate, rhubarb, ginger have been shown to have fantastic prebiotic and anti-inflammatory benefits. Make a point of, several times per day, praying or meditating on peaceful/optimistic and loving thoughts while breathing deeply. The physiologic effects improve autonomic tone and gut function, helping to recolonize healthy bacteria while healing gut membranes. Rhubarb extract prevents hepatic inflammation induced by acute alcohol intake, an effect related to the modulation of the gut microbiota. Neyrinck AM, Etxeberria U, Taminiau B, Daube G, Van Hul M, Everard A, Cani PD, Bindels LB, Delzenne NM. Combination with Red ginseng and Polygoni Multiflori ameliorates highfructose diet induced metabolic syndrome. Kho MC, Lee YJ, Park JH, Cha JD, Choi KM, Kang DG, Lee HS. BMC Complement Altern Med. 2016 Mar 9;16(1):98. doi: 10.1186/s12906-016-1063-7. Chronic Psychological Stress Disrupted the Composition of the Murine Colonic Microbiota and Accelerated a Murine Model of Inflammatory Bowel Disease. Watanabe Y, Arase S, Nagaoka N, Kawai M, Matsumoto S.
PLoS One. 2016 Mar 7;11(3):e0150559. doi: 10.1371/journal.pone.0150559. eCollection 2016. Early Alterations in Glycemic Control and Pancreatic Endocrine Function in Nondiabetic Patients With Chronic Pancreatitis. Lundberg R, Beilman GJ, Dunn TB, Pruett TL, Freeman ML, Ptacek PE, Berry KL, Robertson RP, Moran A, Bellin MD. Pancreas. 2016 Apr;45(4):565-71. doi: 10.1097/MPA.0000000000000491. Kim SB, Kang OH, Lee YS, Han SH, Ahn YS, Cha SW, Seo YS, Kong R, Kwon DY. PLoS One. 2016 Feb 16;11(2):e0147745. doi: 10.1371/journal.pone.0147745. eCollection 2016. Protective Role of Dietary Curcumin in the Prevention of the Oxidative Stress Induced by Chronic Alcohol with respect to Hepatic Injury and Antiatherogenic Markers. Varatharajalu R, Garige M, Leckey LC, Reyes-Gordillo K, Shah R, Lakshman MR.
Oxid Med Cell Longev. 2016;2016:5017460. doi: 10.1155/2016/5017460. Epub 2016 Jan 5. Targeting arachidonic acid pathway by natural products for cancer prevention and therapy. Yarla NS, Bishayee A, Sethi G, Reddanna P, Kalle AM, Dhananjaya BL, Dowluru KS, Chintala R, Duddukuri GR. Semin Cancer Biol. 2016 Feb 4. pii: S1044-579X(16)30003-7. doi: 10.1016/j.semcancer.2016.02.001. [Epub ahead of print] Review. Preventive effect of curcumin on inflammation, oxidative stress and insulin resistance in high-fat fed obese rats. Maithilikarpagaselvi N, Sridhar MG, Swaminathan RP, Sripradha R.
Curcumin Attenuates Oxidative Stress and Activation of Redox-Sensitive Kinases in High Fructose- and High-Fat-Fed Male Wistar Rats. Maithili Karpaga Selvi N, Sridhar MG, Swaminathan RP, Sripradha R.
Sci Pharm. 2014 Nov 4;83(1):159-75. doi: 10.3797/scipharm.1408-16. eCollection 2015. Oral Probiotic VSL#3 Prevents Autoimmune Diabetes by Modulating Microbiota and Promoting Indoleamine 2,3-Dioxygenase-Enriched Tolerogenic Intestinal Environment. Dolpady J, Sorini C, Di Pietro C, Cosorich I, Ferrarese R, Saita D, Clementi M, Canducci F, Falcone M.
J Diabetes Res. 2016;2016:7569431. doi: 10.1155/2016/7569431. Epub 2015 Dec 8. Curcumin prevents paracetamol-induced liver mitochondrial alterations. Granados-Castro LF, Rodríguez-Rangel DS, Fernández-Rojas B, León-Contreras JC, Hernández-Pando R, Medina-Campos ON, Eugenio-Pérez D, Pinzón E, Pedraza-Chaverri J.
J Pharm Pharmacol. 2016 Feb;68(2):245-56. doi: 10.1111/jphp.12501. Epub 2016 Jan 15. Alternating or continuous exposure to cafeteria diet leads to similar shifts in gut microbiota compared to chow diet. Kaakoush NO, Martire SI, Raipuria M, Mitchell HM, Nielsen S, Westbrook RF, Morris MJ. Altered Cell to Cell Communication, Autophagy and Mitochondrial Dysfunction in a Model of Hepatocellular Carcinoma: Potential Protective Effects of Curcumin and Stem Cell Therapy. Tork OM, Khaleel EF, Abdelmaqsoud OM. Asian Pac J Cancer Prev. 2015;16(18):8271-9. Chem Biol Interact. 2016 Jan 25;244:187-94. doi: 10.1016/j.cbi.2015.12.012. Epub 2015 Dec 20. Curcumin protects against gallic acid-induced oxidative stress, suppression of glutathione antioxidant defenses, hepatic and renal damage in rats. Abarikwu SO, Durojaiye M, Alabi A, Asonye B, Akiri O.
Ren Fail. 2016 Mar;38(2):321-9. doi: 10.3109/0886022X.2015.1127743. Epub 2015 Dec 27. Curcumin upregulates Nrf2 nuclear translocation and protects rat hepatic stellate cells against oxidative stress. Liu Z, Dou W, Zheng Y, Wen Q, Qin M, Wang X, Tang H, Zhang R, Lv D, Wang J, Zhao S.
Mol Med Rep. 2016 Feb;13(2):1717-24. doi: 10.3892/mmr.2015.4690. Epub 2015 Dec 17. Morrone Mda S, Schnorr CE, Behr GA, Gasparotto J, Bortolin RC, da Boit Martinello K, Saldanha Henkin B, Rabello TK, Zanotto-Filho A, Gelain DP, Moreira JC. Oxid Med Cell Longev. 2016;2016:5719291. doi: 10.1155/2016/5719291. Epub 2015 Nov 23. Biological and therapeutic activities, and anticancer properties of curcumin. Perrone D, Ardito F, Giannatempo G, Dioguardi M, Troiano G, Lo Russo L, DE Lillo A, Laino L, Lo Muzio L.
Wang L, Lv Y, Yao H, Yin L, Shang J.
Int J Clin Exp Pathol. 2015 Sep 1;8(9):11503-9. eCollection 2015. Curcumin attenuates chronic ethanol-induced liver injury by inhibition of oxidative stress via mitogen-activated protein kinase/nuclear factor E2-related factor 2 pathway in mice. Xiong ZE, Dong WG, Wang BY, Tong QY, Li ZY. Pharmacogn Mag. 2015 Oct-Dec;11(44):707-15. doi: 10.4103/0973-1296.165556. High Fat High Cholesterol Diet (Western Diet) Aggravates Atherosclerosis, Hyperglycemia and Renal Failure in Nephrectomized LDL Receptor Knockout Mice: Role of Intestine Derived Lipopolysaccharide. Ghosh SS, Righi S, Krieg R, Kang L, Carl D, Wang J, Massey HD, Sica DA, Gehr TW, Ghosh S.
PLoS One. 2015 Nov 18;10(11):e0141109. doi: 10.1371/journal.pone.0141109. eCollection 2015. 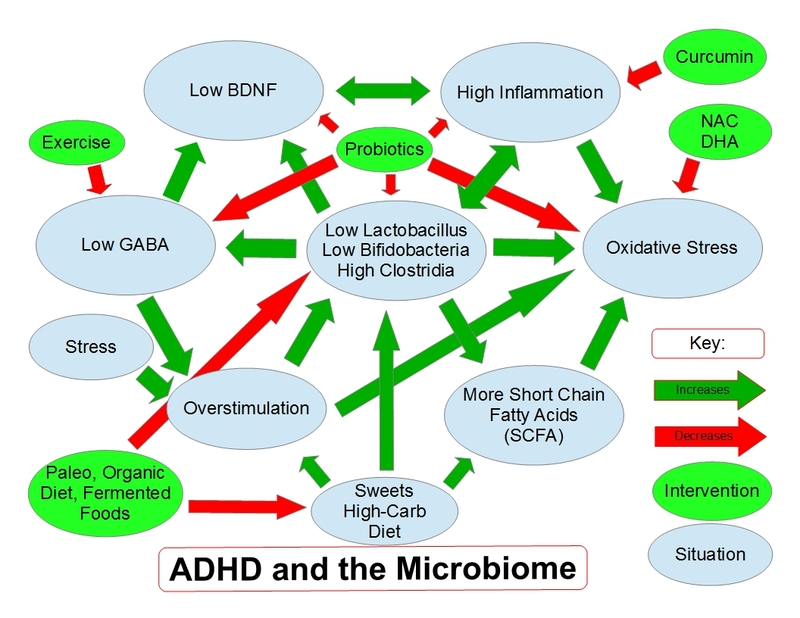 Structural & functional consequences of chronic psychosocial stress on the microbiome & host. Bharwani A, Mian MF, Foster JA, Surette MG, Bienenstock J, Forsythe P.
Psychoneuroendocrinology. 2016 Jan;63:217-27. doi: 10.1016/j.psyneuen.2015.10.001. Epub 2015 Oct 9. T-Helper Cell-Mediated Islet Inflammation Contributes to β-Cell Dysfunction in Chronic Pancreatitis. Talukdar R, Sasikala M, Pavan Kumar P, Rao GV, Pradeep R, Reddy DN. Pancreas. 2016 Mar;45(3):434-42. doi: 10.1097/MPA.0000000000000479. Curcumin Induces Pancreatic Adenocarcinoma Cell Death Via Reduction of the Inhibitors of Apoptosis. Díaz Osterman CJ, Gonda A, Stiff T, Sigaran U, Valenzuela MM, Ferguson Bennit HR, Moyron RB, Khan S, Wall NR. Pancreas. 2016 Jan;45(1):101-9. doi: 10.1097/MPA.0000000000000411. Combination of curcumin and piperine prevents formation of gallstones in C57BL6 mice fed on lithogenic diet: whether NPC1L1/SREBP2 participates in this process? Li Y, Li M, Wu S, Tian Y.
Lipids Health Dis. 2015 Sep 3;14:100. doi: 10.1186/s12944-015-0106-2. Curcumin inhibits lung cancer invasion and metastasis by attenuating GLUT1/MT1-MMP/MMP2 pathway. Liao H, Wang Z, Deng Z, Ren H, Li X.
Int J Clin Exp Med. 2015 Jun 15;8(6):8948-57. eCollection 2015. Curcumin attenuates ethanol-induced hepatic steatosis through modulating Nrf2/FXR signaling in hepatocytes. Lu C, Zhang F, Xu W, Wu X, Lian N, Jin H, Chen Q, Chen L, Shao J, Wu L, Lu Y, Zheng S.
IUBMB Life. 2015 Aug;67(8):645-58. doi: 10.1002/iub.1409. Epub 2015 Aug 25. Curcumin pretreatment mediates antidiabetogenesis via functional regulation of adrenergic receptor subtypes in the pancreas of multiple low-dose streptozotocin-induced diabetic rats. Naijil G, Anju TR, Jayanarayanan S, Paulose CS. Nutr Res. 2015 Sep;35(9):823-33. doi: 10.1016/j.nutres.2015.06.011. Epub 2015 Jul 2. Pancreatic β-Cells Limit Autoimmune Diabetes via an Immunoregulatory Antimicrobial Peptide Expressed under the Influence of the Gut Microbiota. Sun J, Furio L, Mecheri R, van der Does AM, Lundeberg E, Saveanu L, Chen Y, van Endert P, Agerberth B, Diana J. Immunity. 2015 Aug 18;43(2):304-17. doi: 10.1016/j.immuni.2015.07.013. Epub 2015 Aug 4.
iNKT and MAIT Cell Alterations in Diabetes. Magalhaes I, Kiaf B, Lehuen A. Front Immunol. 2015 Jul 2;6:341. doi: 10.3389/fimmu.2015.00341. eCollection 2015. Review. Innate inflammation in type 1 diabetes. Cabrera SM, Henschel AM, Hessner MJ. Transl Res. 2016 Jan;167(1):214-27. doi: 10.1016/j.trsl.2015.04.011. Epub 2015 Apr 29. Review. The dynamics of the human infant gut microbiome in development and in progression toward type 1 diabetes. Kostic AD, Gevers D, Siljander H, Vatanen T, Hyötyläinen T, Hämäläinen AM, Peet A, Tillmann V, Pöhö P, Mattila I, Lähdesmäki H, Franzosa EA, Vaarala O, de Goffau M, Harmsen H, Ilonen J, Virtanen SM, Clish CB, Orešič M, Huttenhower C, Knip M; DIABIMMUNE Study Group, Xavier RJ. Cell Host Microbe. 2015 Feb 11;17(2):260-73. doi: 10.1016/j.chom.2015.01.001. Epub 2015 Feb 5. The impact of diet and lifestyle on gut microbiota and human health. Nutrients. 2014 Dec 24;7(1):17-44. doi: 10.3390/nu7010017. Review. Curcumin enhances recovery of pancreatic islets from cellular stress induced inflammation and apoptosis in diabetic rats. Toxicol Appl Pharmacol. 2015 Feb 1;282(3):297-310. doi: 10.1016/j.taap.2014.12.003. Epub 2014 Dec 23. Curcumin ameliorates streptozotocin-induced liver damage through modulation of endoplasmic reticulum stress-mediated apoptosis in diabetic rats. Afrin R, Arumugam S, Soetikno V, Thandavarayan RA, Pitchaimani V, Karuppagounder V, Sreedhar R, Harima M, Suzuki H, Miyashita S, Nomoto M, Suzuki K, Watanabe K.
Free Radic Res. 2015 Mar;49(3):279-89. doi: 10.3109/10715762.2014.999674. Epub 2015 Jan 28. Curcumin improves high glucose-induced INS-1 cell insulin resistance via activation of insulin signaling. Song Z, Wang H, Zhu L, Han M, Gao Y, Du Y, Wen Y. Food Funct. 2015 Feb;6(2):461-9. doi: 10.1039/c4fo00608a. Curcumin ameliorates testicular damage in diabetic rats by suppressing cellular stress-mediated mitochondria and endoplasmic reticulum-dependent apoptotic death. Biochim Biophys Acta. 2015 Jan;1852(1):70-82. doi: 10.1016/j.bbadis.2014.11.007. Epub 2014 Nov 11. The gut microbiota modulates glycaemic control and serum metabolite profiles in non-obese diabetic mice. Greiner TU, Hyötyläinen T, Knip M, Bäckhed F, Orešič M.
PLoS One. 2014 Nov 12;9(11):e110359. doi: 10.1371/journal.pone.0110359. eCollection 2014. Resveratrol and curcumin enhance pancreatic β-cell function by inhibiting phosphodiesterase activity. Rouse M, Younès A, Egan JM. J Endocrinol. 2014 Nov;223(2):107-17. doi: 10.1530/JOE-14-0335. Exposure to a social stressor disrupts the community structure of the colonic mucosa-associated microbiota. Galley JD, Nelson MC, Yu Z, Dowd SE, Walter J, Kumar PS, Lyte M, Bailey MT. BMC Microbiol. 2014 Jul 15;14:189. doi: 10.1186/1471-2180-14-189. Gut microbiota, probiotics and diabetes. Gomes AC, Bueno AA, de Souza RG, Mota JF. Nutr J. 2014 Jun 17;13:60. doi: 10.1186/1475-2891-13-60. Review. Circadian disorganization alters intestinal microbiota. Voigt RM, Forsyth CB, Green SJ, Mutlu E, Engen P, Vitaterna MH, Turek FW, Keshavarzian A.
PLoS One. 2014 May 21;9(5):e97500. doi: 10.1371/journal.pone.0097500. eCollection 2014. A maternal gluten-free diet reduces inflammation and diabetes incidence in the offspring of NOD mice. Hansen CH, Krych L, Buschard K, Metzdorff SB, Nellemann C, Hansen LH, Nielsen DS, Frøkiær H, Skov S, Hansen AK. Diabetes. 2014 Aug;63(8):2821-32. doi: 10.2337/db13-1612. Epub 2014 Apr 2. Impact of stressor exposure on the interplay between commensal microbiota and host inflammation. Gut Microbes. 2014 May-Jun;5(3):390-6. doi: 10.4161/gmic.28683. Epub 2014 Apr 1. Review. Study of expression of TLR2, TLR4 and transckription factor NF-kB structures of galt of rats in the conditions of the chronic social stress and modulation of structure of intestinal microflora. Georgian Med News. 2013 Dec;(225):115-22. Curcumin inhibits tumor growth and angiogenesis in an orthotopic mouse model of human pancreatic cancer. Bimonte S, Barbieri A, Palma G, Luciano A, Rea D, Arra C.
Biomed Res Int. 2013;2013:810423. doi: 10.1155/2013/810423. Epub 2013 Nov 10. Human intestinal microbiota and type 1 diabetes. Curcumin attenuates diet-induced hepatic steatosis by activating AMP-activated protein kinase. Um MY, Hwang KH, Ahn J, Ha TY. Exposure to a social stressor alters the structure of the intestinal microbiota: implications for stressor-induced immunomodulation. Bailey MT, Dowd SE, Galley JD, Hufnagle AR, Allen RG, Lyte M.
Brain Behav Immun. 2011 Mar;25(3):397-407. doi: 10.1016/j.bbi.2010.10.023. Epub 2010 Oct 30. The role of oral administration of oatmeal fermented by Lactobacillus reuteri R2LC on bacterial translocation after acute liver failure induced by subtotal liver resection in the rat. Wang XD, Soltesz V, Molin G, Andersson R.
Scand J Gastroenterol. 1995 Feb;30(2):180-5. Johansson ML, Molin G, Jeppsson B, Nobaek S, Ahrné S, Bengmark S.
Appl Environ Microbiol. 1993 Jan;59(1):15-20. Effect of fermented oatmeal soup on the cholesterol level and the Lactobacillus colonization of rat intestinal mucosa. Molin G, Andersson R, Ahrné S, Lönner C, Marklinder I, Johansson ML, Jeppsson B, Bengmark S.
Antonie Van Leeuwenhoek. 1992 Apr;61(3):167-73. This entry was posted in Uncategorized and tagged autism, brain, fermented, gut bacteria, hologenome, inflammation, kefir, kombucha, lactobacillus, microbiome, microbiota, probiotic, symbiont, symbiosis, yogurt on March 30, 2016 by Dr. Richard Matthews. New Study shows a Bacterial Colony communicates like a Brain! A new study published recently has shown that bacterial colonies have an additional channel of communication than previously thought-they can communicate through ionic channels between cells. This allows bacteria in a colony to exchange data through electrical impulses; electrically charges particles (ions) in a manner remarkably similar to how a brain’s neurons communicate with one another! This new study is fascinating to me, as one of the principal concepts in The Symbiont Factor was that a bacterial colony acts more like a multicellular organism than a group of single celled organisms. Professor Eshel Ben-Jacob had shown this communication ability through his many research studies, and was the first (as far as I know) to profess that colonies functioned in a logical intelligent manner. 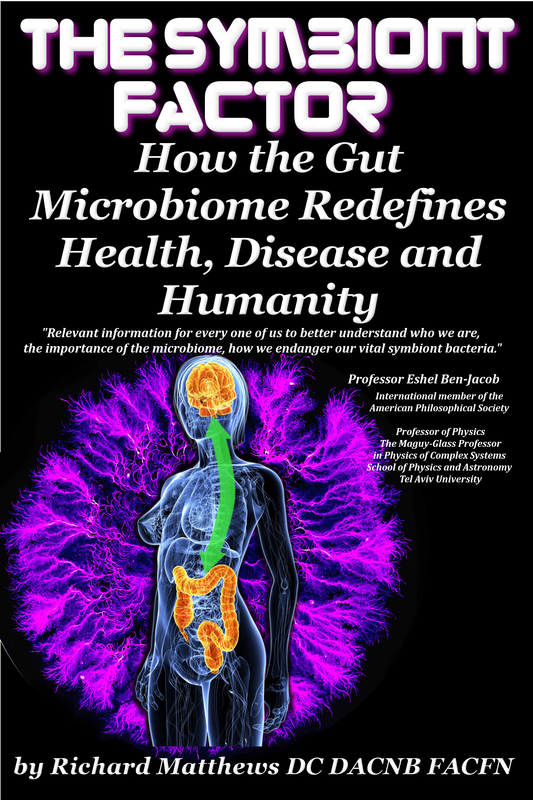 In my book, I show how gut bacteria influence the host organism to facilitate their continued survival and reproduction (traits normally attributed to far more complex organisms) by altering our metabolism, gut function, appetite for different items, brain function and many other variables. This new study should make the health of your symbiont bacterial colony even more of a priority! This entry was posted in Uncategorized and tagged ai, artificial intelligence, bacteria, brain, gut bacteria, microbiome, symbiont, the symbiont factor on October 26, 2015 by Dr. Richard Matthews. Australopithecus sediba, our vegetarian past? What does it take to grow a brain? I’m watching a PBS special about some new fossils of our ancestors, specifically Australopithecus sediba, discovered in a cave in South Africa. I noted that the reconstruction of the ribcage appeared to be wide and consistent with an individual having a large abdomen, similar to a gorilla, providing room for a long enough digestive tract to digest a mostly vegetable diet. Just as horses and cattle need a relatively large abdomen to provide a “fermentation vessel”, so too the gorilla (and A. sediba) have a skeletal structure to accommodate this structure. Later in the show, it was revealed that dental calculi (plaque) provided evidence of a vegetarian high-fiber diet. This validates my observation of the ribcage dimension and clinches, in my mind, that this ancestor was a veggie eater. The braincase suggests that this ancestor had not yet evolved the larger brain, particularly frontal lobes, characteristic of modern humans. Scientists have identified two requirements for the evolution of large brains (termed “encephalizaton”). The first requirement is sociality, as much of the brain enlargement is frontal lobe and this part of the brain is where much of our social dynamic originates from. Executive functions, self control, altruism are frontal lobe functions for the most part. Species with large frontal lobes have advanced social societies (dolphins, whales, elephants are prime examples). The second requirement is DHA, an essential fatty acid found mostly in seafood but also in fats of prey animals. It is thought by many research authors (see Ben-Dor and Jandhayala below in references) that mankind’s encephalization involved a shortening of the digestive tract to support eating more energy-dense foods like meats and fats. The consumption of plant material for a diet requires that most of the waking time be spent foraging and eating, and the digestive process depends on a large gut. The development of tools and weapons was a necessary step to becoming an omnivore, as was the development of social structure necessary to successfully hunt larger prey animals. It is for these reasons that a diverse and unique gut bacteria were a critical component of our development. The gut bacteria help produce BDNF (brain derived neurotrophic factor), required for the development of new brain cells and is essential for plasticity and learning. High levels of DHA in the diet also help with BDNF production. 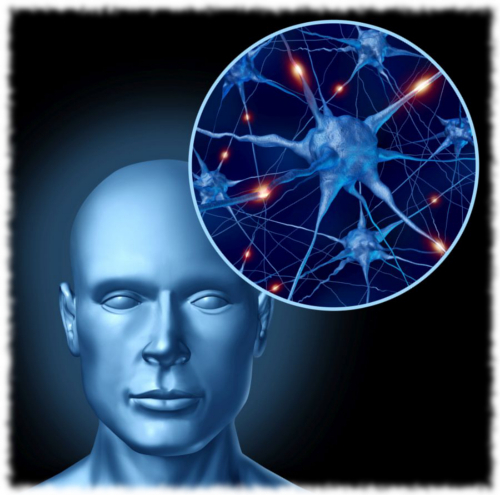 The human brain requires essential fats in the diet to support both its energy requirements and its health. 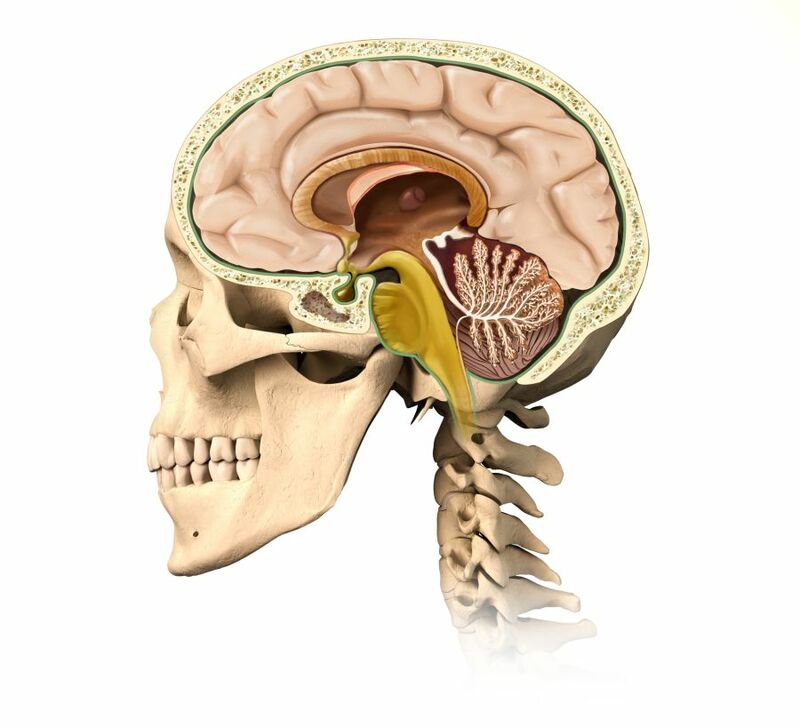 There is evidence that during the phases where early man was developing the large brain characteristic of our species, diet shifted from plant based to include meat and fat. Those near the ocean likely obtained all the DHA fats needed from seafood, while those dwelling inland may have obtained it from…brains and marrow fat. Fossil remains show that prey animals consumed by early man have been found with cranial vault damage suggesting that the brain was removed for consumption. Obviously, those living near the ocean had a much easier time of things, as clams do not run fast nor pose much of a threat! Ancient settlements near water are often characterized by large piles of seashells. What this boils down to is that we developed our big and (usually) useful brains due to a dietary shift away from vegetarian to eating meat and animal fats. Accompanying this shift, and codependent on it, was a behavioral shift toward toolmaking, weapon use, and increased social interaction. It should also be noted that as I explained in The Symbiont Factor, a higher functioning brain is codependent on a diverse microbiome. More brain activity helps the gut become healthy and encourages a healthy microbiome, and vice versa. The modern Western diet has high levels of omega-6 fats, which displace DHA and increase inflammation, leading to more disease and less brain development! That type of diet is also typically very unheathy for the microbiome, further hindering brain function. A vegetarian or vegan diet can still be brain-healthy, but apparently not without additional supplementation of DHA as even the presence of healthy fats in vegetable sources does not provide enough DHA due to a low conversion rate. That subject is discussed at length in some of the references provided, and may be fodder for many who have strong opinions one way or the other. This entry was posted in Uncategorized and tagged australopithecus, BDNF, brain, cave man diet, dha, epa, fossil, microbiome, paleo, paloeolithic, sediba, vegetarian on September 17, 2015 by Dr. Richard Matthews.